Today’s thieves are becoming extremely adept at attaining stolen data to deplete existing accounts, max credit limits, apply for jobs, and obtain mortgages. Becoming a victim of identity theft can end up costing you a ton of time, stress, and money. The Federal Trade Commission (FTC) estimates 10 million Americans are victims of ID fraud every year. Thieves do not need a lot of information in order to steal your identity, just one critical piece of data such as your Social Security number or your mother’s maiden name gives access to a lot more information. Many identity thieves use this information to impersonate organizations by calling or sending phishing scam emails to obtain your personal information. The idea being that people are more likely to respond to and trust a phone call or an email when it appears they are from groups they belong to. While many of us are wary in giving out our personal phone numbers, identity thieves are still tapping into this medium by using automated callers or even impersonating institutions to obtain any bit of personal information they can use. While used more rarely these days, many scams are still attempted through mail in the form of fake bills, sweepstakes scams, or change-in-service notifications which display a phony customer service number. Scammers can use your address to inititate a change of address order, rerouting all of your mail even if just for a few days before it’s caught. Passport numbers can result in a wealth of information for cons such as your full name, date of birth, place of birth, and nationality. Your photo can easily be manipulated and thieves can open accounts internationally. Like your passport, your driver’s license contains personal information a thief can use to assume your identity, even more so including basic physical appearance date, height weight, eye color, etc. This seems pretty obvious but you’d be surprised how many people keep this information stored in their phones, or written down in their wallets. With this kind of access, a thief can get into your email, social networks, and personal accounts doing some serious damage. Make sure you change your passwords frequently and try not to use things like your birthday or information someone can easily be attained or that people know about you. You might not think someone can get access to your personal information just by knowing your birthdate but it’s used in the creation of nearly every account. It’s also one of the most common and easily-used pieces of information to verify existing accounts. Be careful who you share your personal information with. It’s easily attainable. 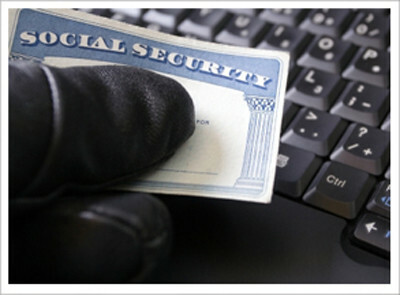 Do you carry your Social Security number in your wallet or purse? This number is used by nearly every government and financial institution as your primary form of identification. It can provide crooks access to your medical, financial, credit and educational records. Don’t leave mail in your mailbox overnight or on weekends; deposit outgoing mail at the post office and promptly remove mail from your mailbox after delivery. Be wary of what information you put out over the internet on social networking sites, these places are mining fields for identity thieves.